The rake is the angle formed between the neck on the frame of a bike and a vertical line. The bigger the angle, the further out the front wheel will be from the frame. The distance between the point where the tire makes contact with the ground and a vertical line from the center of the front wheel's steering axis to the ground is the bike's trail. Trail is measured in inches, and in motorcycles should always be a positive number -- a negative trail means an unstable ride. Trail is important - too little or too much trail and the bike will be sluggish or even impossible to control. Bike experts all have different opinions on what's the ideal trail length, but it tends to range between 3.5 and 6 inches. While there's a relationship between a bike's rake and its trail, it's not always obvious. In most cases, increasing the rake of a bike's frame will increase positive trail, though this depends on what kind of fork assembly you use. 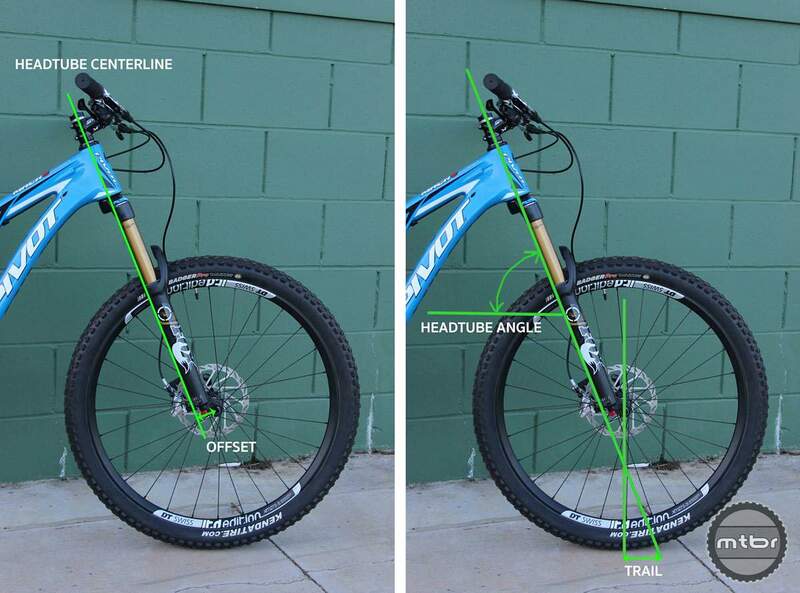 A bike with lots of trail will be directionally stable. It will tend to go straight and be easy to ride hands-off. It will not have its direction changed by every tiny bump in the road. Such a bike will take more physical effort to steer than a bike with less trail. A bike with only a little trail will be livelier (some would say “squirrellier”). It will take very little effort to change its direction whether that effort comes from your hands on the bars or from a bump in the road. Cruisers and touring bikes tend to have large trail dimensions and sportier bikes tend to have less.